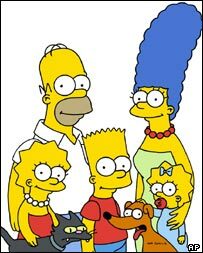 The Simpsons is more than a funny cartoon - it reveals truths about human nature that rival the observations of great philosophers from Plato to Kant... while Homer sets his house on fire, says philosopher Julian Baggini. With the likes of Douglas Coupland, George Walden and Stephen Hawking as fans, taking the Simpsons seriously is no longer outre but de rigeur. It is, quite simply, one of the greatest cultural artefacts of our age. So great, in fact, that it not only reflects and plays with philosophical ideas, it actually does real philosophy, and does it well. How can a comic cartoon do this? Precisely because it is a comic cartoon, the form best suited to illuminate our age. To speak truthfully and insightfully today you must have a sense of the absurdity of human life and endeavour. Past attempts to construct grand and noble theories about human history and destiny have collapsed. We now know we're just a bunch of naked apes trying to get on as best we can, usually messing things up, but somehow finding life can be sweet all the same. All delusions of a significance that we do not really have need to be stripped away, and nothing can do this better that the great deflater: comedy. The Simpsons does this brilliantly, especially when it comes to religion. It's not that the Simpsons is atheist propaganda; its main target is not belief in God or the supernatural, but the arrogance of particular organised religions that they, amazingly, know the will of the creator. "What's the big deal about going to some building every Sunday, I mean, isn't God everywhere?" "Don't you think the almighty has better things to worry about than where one little guy spends one measly hour of his week?" "And what if we've picked the wrong religion? Every week we're just making God madder and madder?" Homer's protests do not merely allude to much subtler arguments that proper philosophers make. The basic points really are that simple, which is why they can be stated simply. And that's true even for the philosophers, whose high-level arguments are virtuosi feats of reasoning, but are not the things that win hearts and minds. They are merely the lengthy guitar solos to Homer's crushing, compelling riffs. However, being simple is not the same as being simplistic, which is one of the greatest crimes in the Simpsons' universe. We can see this when Homer's house catches fire, in what could be seen as divine retribution for his apostasy. But what actually led to the fire was not God's wrath but Homer's hubris and arrogance. Sitting on his sofa thinking smugly, "Boy, everyone is stupid except me," he falls asleep, dropping his cigar. What really caused the fire was thus a slippage from the simple into the simplistic. 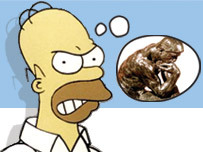 Homer's mistake was to think that because the key points which inform his heresy are simple, that the debate is closed and he has nothing left to learn from others. But this is being simplistic, not keeping things simple. Revealing simple truths about simplistic falsehoods is not just a minor philosophical task, like doing the washing up at Descartes' Diner while the real geniuses cook up the main courses. For when it comes to the relevance of philosophy to real life, all the commitments we make on the big issues are determined by considerations which are ultimately quite straightforward. 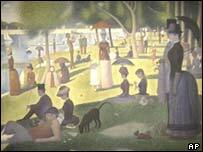 A rich philosophical worldview is in this sense like a pointillist picture - one of those pieces of art in which a big image is made up of thousands of tiny dots (see Seurat image, right). Its building blocks are no more than simple dots, but the overall picture which builds up from this is much more complicated. Yet we need reminding that the dots are just dots, and that errors are made more often not by those who fail to examine the dots carefully enough, but those who become fixated by the brilliance or defects of one or two and who fail to see how they fit into the big picture. And the Simpsons certainly plays out on a broad canvas. Any individual or group is shown to be ridiculous when only their pathetic and partial view of the world is taken to be everything. That's why no one escapes satire in the programme, which is vital for its ultimately uplifting message: we're an absurd species but together we make for a wonderful world. The Simpsons, like Monty Python, is an Anglo-Saxon comedic take on the existentialism which in France takes on a more tragic hue. Albert Camus' absurd is defied not by will, but mocking laughter. Another reason why cartoons are the best form in which to do philosophy is that they are non-realistic in the same way that philosophy is. Philosophy needs to be real in the sense that it has to make sense of the world as it is, not as we imagine or want it to be. But philosophy deals with issues on a general level. It is concerned with a whole series of grand abstract nouns: truth, justice, the good, identity, consciousness, mind, meaning and so on. Cartoons abstract from real life in much the same way philosophers do. Homer is not realistic in the way a film or novel character is, but he is recognisable as a kind of American Everyman. His reality is the reality of an abstraction from real life that captures its essence, not as a real particular human who we see ourselves reflected in. The satirical cartoon world is essentially a philosophical one because to work it needs to reflect reality accurately by abstracting it, distilling it and then presenting it back to us, illuminating it more brightly than realist fiction can. 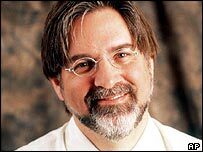 That's why it is no coincidence that the most insightful and philosophical cultural product of our time is a comic cartoon, and why its creator, Matt Groening, is the true heir of Plato, Aristotle and Kant. Julian Baggini is talking about the philosophy of The Simpsons at The Watershed, Bristol as part of The Bristol Festival of Ideas at 1500 BST on Saturday 20 May. Homer has said many great things, one that comes to mind is :"no problem is so big that it can't be ignored" at first it seems irresponsible but then again life is too short and precious to keep worrying about things which we can not influence. Years ago there was a book called 'The Parables of Peanuts' that analysed the Snoopy and Charlie Brown cartoons of the same name. When the show first began, I said, "No way are my kids watching this." But then I began to see beyond Bart and Homer's comic stupidity to the good lessons underneath. Now the whole family (the kids are grown now) watches and discuss the satire and adaptations of movies, literature and current events. Curiously, Julian's interpretation of Homer the Heretic is opposite to that the episode itself makes. The point is made (by Marge) that Homer has created these quips as excuses to disengage from faith, and has to be rescued from the fire by those still engaged enough to be willing to take action (Apu and Flanders). Far from being "simple philosophical truths", his quips are "tempting excuses for inaction". So perhaps the Simpsons' main gift is to be vague enough to read whatever you like into it. It's a lot to put on the shoulders of our local hero, Groening, to call him an ambassador of American culture, but every episode does seem to illustrate our country's ridiculous character in a way that no well-spoken diplomat can. I'm glad it's appreciated the world over...I'm proud every time I walk down Flanders St... and Lovejoy St... and Quimby St... and when I pass the Trojan Nuclear Power Plant. Can we not keep the Simpsons as a funny, irreverent comment on modern Western culture? Reducing it to an abstract science takes all the pleasure out of watching it. The Simpsons has had a very positive influence on my life since I begrudgingly started watching it about 10 years ago. Bound within Greoning's imaginary world is not one world view but a whole serious of competing, and as Mr Baggini says, partial world views. Homer is an idiot savant who shows us the folly of our own rigistic thinking. He is often stupid, and sometimes irritating, but no more so that those around him who claim a more sophisticated outlook, whether it is religious, moral, legal or intellectual. And in counter pointing Homer's antics with their antithesis, such as Lisa's dogged earnestness, he allows us to compare and contrast a range of opinions and attitudes. But enough... The Simpsons rules! As Homer once said, while watching cable TV in his house (cable TV he was watching illegally): "It's funny because it's true." That's why The Simpsons works. Bravo! It is time that we recognised the message in the satire - I would personally liken this creation to the satirical works of Voltaire more than Kant, but if philosophy performs a function, it is in Marx's words, to change the world rather than just interpret it. Maybe it is time that society took a good hard look at itself in the mirror which seemingly banal creations like The Simpsons hold up to it. I thought Pseuds' Corner was in Private Eye. Surely it follows that anything created by humans will have some essence of philosophy. I remember when the Teletubbies first came out people tried the same trick. Why we can't just say, "they're funny little yellow dudes that make me laugh". It can work on another level, but then if you analyse anything closely it can. Why do philosophers say things we can't understand: "The Simpsons, like Monty Python, is an Anglo-Saxon comedic take on the existentialism which in France takes on a more tragic hue. Albert Camus' absurd is defied not by will, but mocking laughter." What's that all about? The Simpsons is great because we can all relate to it. End of. Homer is the modern day Plato, except obese & he doesn't know he's a genius.